Hypnosis is the answer to putting all of your knowledge into words in order to negotiate the best possible deal. Knowing what to say and how to say it is an important part of the negotiation process. Often the information is stored somewhere in the depths of the mind, yet coming up with the right words as they are needed can prevent even the best thought through ideas from coming out. With hypnosis, the cluttered mind is cleared for effective negotiation. Hypnosis is a non-medical, all natural way to relax, increase confidence, and improve recall. These are all elements to being able to think quickly on your feet and negotiate exactly what you want. Hypnosis has the ability to bring about real physical and mental changes that will improve your negotiating skills. The physical changes that can be affected by hypnosis are found when the pressure is on. Instead of getting sweaty palms or resorting to nervous laughter, you can retort with a cool calmness to any offer that is presented. Hypnosis does this by training the mind to relax and the symptoms of nervousness shown in the body will follow suit. Dr. Steve G. Jones M.Ed. 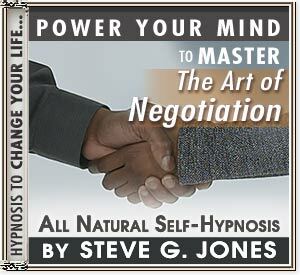 is a clinical hypnotherapist who has created a program for those who want to be better at negotiating. His CD, “Master the Art of Negotiation” helps you learn to relax. It also clears away unproductive thoughts and the responses that go with them so that rational thinking can take over and seal the deal. Before trying to buy a new car, ask for a raise, interview for a new job, or get your teenager to do more around the house, learn to master the art of negotiation through hypnosis.